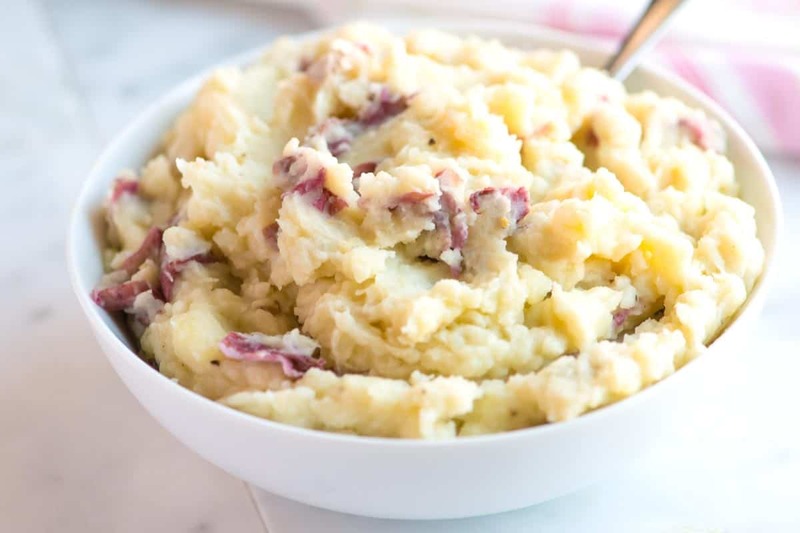 Our favorite homemade mashed potatoes recipe that works with skin-on and peeled potatoes. Learn which potatoes to use and how to cook them so that they are creamy and delicious. Jump to the Homemade Mashed Potatoes Recipe or watch our quick video below to see how we make them in our kitchen. We adore mashed potatoes and make them often. 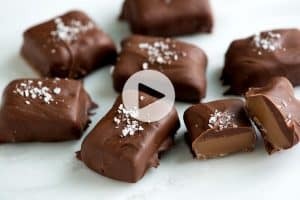 Since we make a batch almost every week, we wanted to share our favorite way to make them. The recipe varies slightly depending on who makes it. Adam likes to keep the potatoes unpeeled and I usually peel. Sometimes we use milk, sometimes we add a splash of chicken stock. And when we’re feeling feisty, we add a spoonful of sour cream or splash of cream. Think of this as an everyday recipe – one that you can adapt based on what you have in the fridge (or whoever is making it). I use waxy and thin-skinned potatoes. Small yellow, white, or red potatoes are perfect. They are quick to cook and make the best skin-on mashed potatoes! We are usually short on time, so the smaller potatoes allow us to skip peeling and just slice in half or quarters. They are also creamier than more starchy potatoes, like russet potatoes. So if you love creamy mashed potatoes, choose one of the small, thin-skinned varieties. 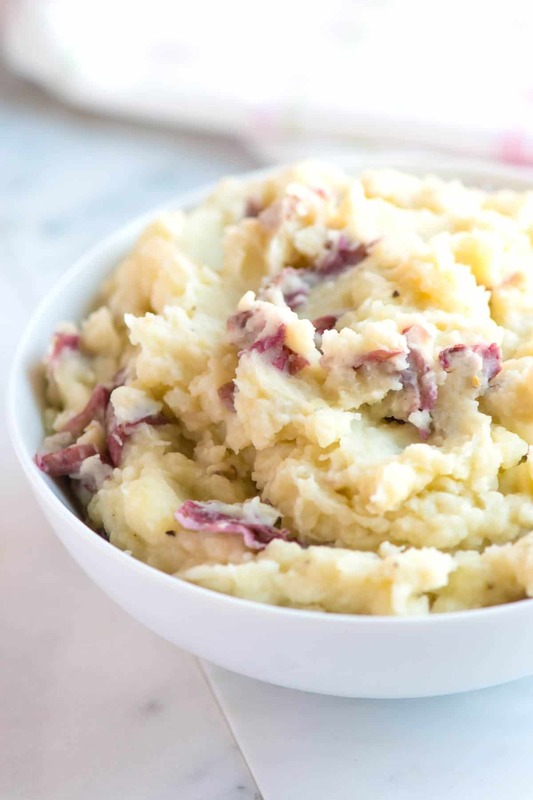 If you love fluffy mashed potatoes, use use russet (baking) potatoes or for a combination of fluffy and creamy, use both waxy potatoes and starchy potatoes. Adam and I go back and forth about peeling the potatoes. Adam loves keeping the skins on and I prefer when the potatoes are peeled. It’s safe to say that whether or not our potatoes are peeled depends on who’s making them. Cut the potatoes into a similar size. You want the potatoes to cook evenly and keeping the potatoes a similar size helps with that. I cut mine into medium chunks (1 to 2 inches). At that size, the potatoes take about 15 minutes to cook. Salt the cooking water. No matter what potato you choose to cook, don’t forget the salt. A tablespoon of salt should do it. Just like when you add salt to pasta water, the salty water seasons the potatoes. They won’t taste salty, only like awesome potatoes. Just like seasoning pasta water, it is important to season the cooking water for potatoes. Simmer until fork tender. When I can easily pierce a potato with a fork, they are done. Cooking longer than that means that the potatoes will be overcooked, which makes them like glue. Drain them well. Once the potatoes are done, I drain them, return them to the saucepan and cover with a clean dishtowel for about 5 minutes. This helps the potatoes absorb excess steam that can make mashed potatoes watery. Another option is to tumble the cooked potatoes onto a baking sheet and set aside for 5 minutes. Add warm butter and milk or stock. 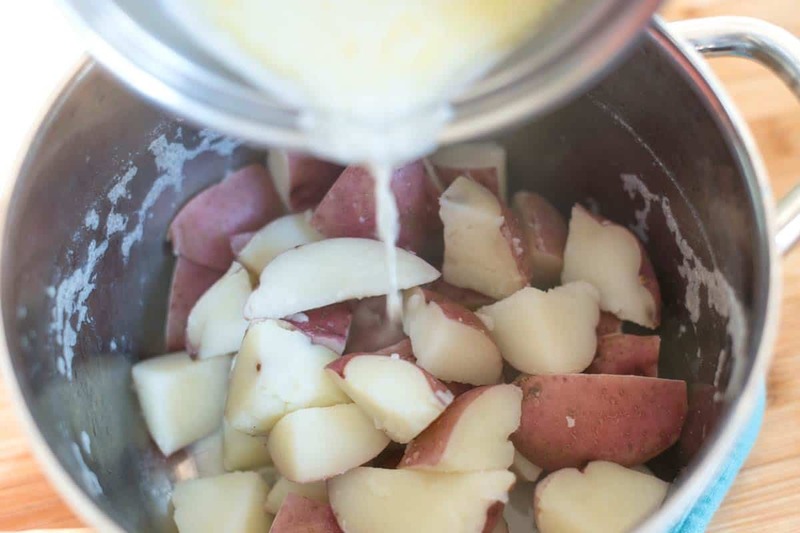 We add some liquid and melted butter to make the potatoes extra creamy. For the liquid, we usually add equal parts of milk and chicken stock. You could add all milk or all chicken stock. You could even add a splash (or two) of cream to the potatoes to make them really creamy. Warm liquid absorbs better than cold and it keeps the mashed potatoes nice and hot. We stick to 1 cup of liquid for 2 pounds of cooked potatoes. For stiffer mashed potatoes, reduce the amount of liquid to 3/4 cup from 1 cup. Adding the butter, milk (or stock) warm helps the potatoes to absorb it and keeps the mashed potatoes nice and warm. Hand Mash. Most of the time, we use our handy potato masher, but for extra creamy potatoes, use a food mill. Pass cooked potatoes through the smallest disk of a food mill then stir in milk or chicken stock and butter. (It’s best the potatoes are peeled for this). I don’t recommend using a food processor and if you use a hand blender, be careful not to over whip the potatoes since over mixing makes mashed potatoes sticky and gluey. Make them extra creamy. When I want ultra-creamy mashed potatoes, I add a dollop of sour cream. The tanginess of sour cream cuts the richness of the butter and makes the potatoes so creamy. Add extra flavors. You can add a variety of extra ingredients to mashed potatoes. 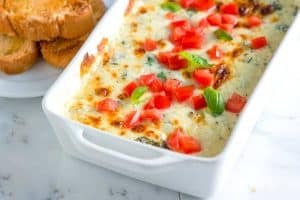 Try garlic (fresh or roasted garlic), fresh herbs, chives, scallions, cream cheese, shredded cheese, and even cooked and crumbled bacon. Adam loves pouring lots of creamy gravy on top of his. Rotisserie chicken from the store is a quick meal or you can roast your own chicken. Roast turkey is also incredible. Here’s our rosemary garlic roasted turkey breast recipe. I love these potatoes next to a slice of turkey meatloaf, baked salmon, and this roasted pork tenderloin. Add even more sides to your plate with honey roasted carrots or crispy roast broccoli. Creamy Mashed Sweet Potatoes — it’s easy to fall in love with this easy mash made with butter and a hint of cinnamon. Simple Potato Salad — see all of our tips for making it best. The recipe has so many happy reviews! Roasted Garlic Mashed Potatoes — the recipe is similar to this one, but we show you how to roast garlic and add them to the potatoes. Rosemary Baked Potato Wedges — potato wedges that are perfectly browned and crisp on the outside and tender on the inside. Our favorite way to make mashed potatoes. Think of this as an everyday recipe – one that you can adapt based on what you have in the fridge. We call for 1 cup of liquid to be added to the potatoes. At home, we usually use equal parts milk to chicken stock. You could use all milk or all chicken stock. Or, replace some milk with heavy cream or sour cream for extra decadent potatoes. A tablespoon or two of cream cheese wouldn’t hurt, either. The trick to great mashed potatoes is seasoning up front. Adding a hearty amount of salt to the water seasons the potatoes while they cook – we use at least 1 tablespoon. This is similar to salting pasta water. Scrub then dice potatoes, making sure they are similar in size. (We often leave the skin on the potatoes, but it is completely up to you). 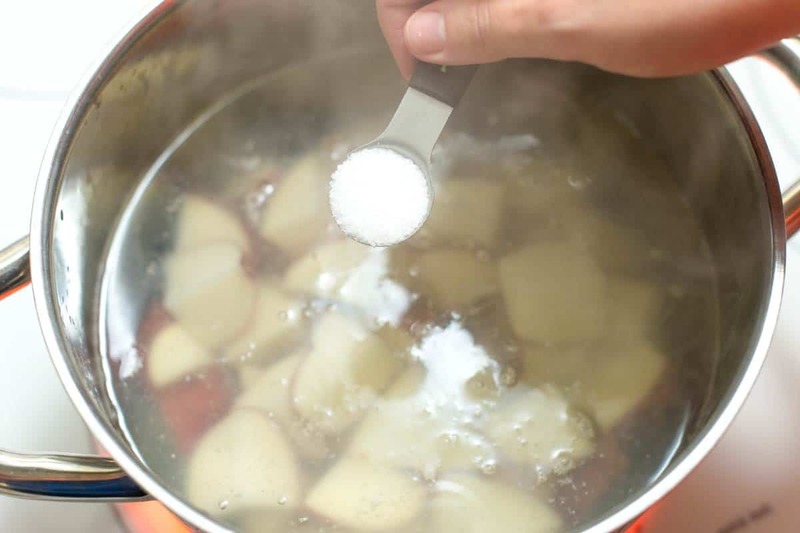 Drop potatoes in a large saucepan, add a tablespoon of salt and cover with water. Bring to a boil over medium-high heat then reduce to a low simmer. Cook until the potatoes fall apart when pierced with a fork, 15 to 20 minutes. Heat the milk or chicken stock, and the butter until warm and the butter has melted. Drain then return the potatoes to the saucepan and cover with a clean dishtowel. Leave them for about 5 minutes to absorb excess steam that can make mashed potatoes watery. Pour in the warm butter mixture then mash the potatoes until creamy. (Don’t worry if the potatoes seem a bit thin at first, they absorb the liquid after a minute or two). Stir in the pepper and splash of cream or sour cream (if using). Taste for seasoning and adjust with additional salt and pepper. Let stand for 5 minutes so that the potatoes thicken, and then serve. You can use russet (baking) potatoes. The mashed potatoes will be a bit fluffier. For stiffer mashed potatoes, reduce the amount of liquid called for in the recipe to 3/4 cup from 1 cup. For extra creamy potatoes, use a food mill. Pass the cooked potatoes through the smallest disk of a food mill then stir in milk or chicken stock and butter. (It’s best the potatoes are peeled for this). Nutrition facts: The nutrition facts provided below are estimates. We have used the USDA database to calculate approximate values. We have omitted salt since you will need to add to your tastes. We assumed 1/2 milk to 1/2 stock and added a splash of cream. For the nutrition facts, what do you consider a serving of these? They’re delicious!! Hi Ashley, The recipe makes 6 servings. I would change one thing about this recipe. I was taught a long time ago that the less you cut up the potatoes the less water they will absorb. Thus a creamier mashed potatoes. I’ve had mashed potatoes that seemed soggy before. Haven’t you? I betchya it was bc they were cut up into small pieces so each piece more easily absorbed more water. I used to do this to make them cook as quickly as possible. Make the time to be able to throw in the potato whole. Big diff. Trust me. Would you recommend low sodium chicken broth? And how about the butter? Salted or unsalted? We usually reach for low sodium broth and often use unsalted butter, but you can use what you have in your kitchen. When it comes to seasoning the final dish, taste first then adjust with additional salt if you feel it necessary. this was the easiest and yummmiest mashed potatoes i have ever made!!! 🙂 thank you again inspired by taste! I also cant remember where i read about it but i used a hand held mixer to mash the potatoes and mix it with the milk mixture! the result was great – it was creamy and fluffy even if it splattered initially. I used russet potatoes because that is all I had on hand. 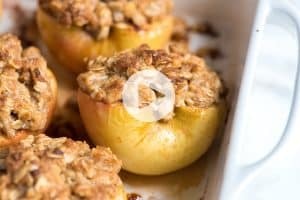 The recipe is super simple and tastes great! I do add a little bit of garlic because I prefer garlic potatoes over regular. The skins on the russet potatoes are a little bit tougher so I am going to try red or yellow potatoes next time. I also added half a block of cream cheese and they were super creamy. Definitely my new favorite recipe, thank you! salt, but could be seasoned however you like to taste. Result was a unique delicious rustic root vegetable blend with lots more character than traditional mashed potatoes! So good. Will try this recipe! I made mashed potatoes for thanksgiving and used white potatoes but they came out too gluey. I think I overprocessed them? Next time, if you love extra smooth fluffy potatoes, try using a food mill. I love this recipe! I did the butter, 1/2 cup heavy cream 1/2 cup whole milk and cup of veggie broth. It’s so delicious and I left the skins on the red potatoes-excellent! I used this recipe for my thanksgiving dinner tonight and the taters were a HIT! After dinner I looked over your recipe again and noticed you were from Walla Walla. So am I! Small world.. thank you for this great recipe! A wonderful simple recipe. I made it a couple days ago. My boyfriend refilled it 3 rounds. Love it ! hi i love this recipe!!! just have one question, the “cream” is heavy cream? You can use heavy cream, milk or a combination. These sound great. I would like to make them for Thanksgiving. I want to make them the night before and warm them in my crock pot the day of. Do you think that will work with this recipe. If so, is there anything I would need to do to them before serving? Thanks. Hi Sheila, This will work great. I’d keep a little extra milk/broth on hand for splashing into the crockpot just in case the potatoes seem too thick the next day. Otherwise, it should work really well for you. Great recipe. 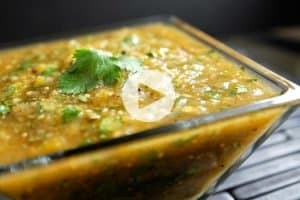 I’ve made these many times using a recipe very similar to this but I’ve never heard of covering them with a dishtowel. When you return the potatoes to the saucepan and cover, is the saucepan still on a burner at low temp or is it off? I have an electric stovetop so the burner stays hot for quite a long time. Thanks! We slide the pan off of the heat. First timer on this site, made them last night, skin off and added crushed garlic with liquids. Best mashed potatoes. Had it with steak and corn. Left them with the skin on & family really enjoyed. Great technique. Your recipes are always winners and I appreciate the level of detail you go to. Can’t fail. I just made these, and need to quit eating them to save some for the turkey I’m roasting. Used red potatoes, skins on. Also added a tad of garlic at the end. I love your style….”you can do it this way but you can also do it that way”….spoken like a true cook! I love adaptable recipes. I usually don’t like to comment on things I haven’t made yet, but I couldn’t resist saying how much I appreciate what I have read so far. I have you bookmarked and I look forward to trying your recipes! So yummy!!!! Best mash I have ever made!!! This went well with the turkey meatloaf recipe from this site- dinner was a hit!